Somerset Lavender produce the fine quality lavender essential oil growing English lavender on the farm in Faulkland. Dried lavender flowers are also traditionally produced for pot pouri and lavender bags. The farm has a huge selection of named varieties of lavender plants for sale. Visitors can see the lavender fields and enjoy refreshments in the Farm Shop and café open Wednesday to Sunday 10 am to 5 pm from 1 May to 30 September. 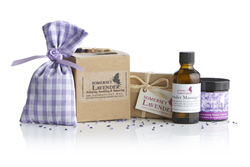 Or you can find Somerset Lavender at Frome Farmers’ Market in the Cheese and Grain. This entry was posted in Frome, Fruit, Vegetables, Plants and Flowers, Occasional, Speciality products. Bookmark the permalink. Both comments and trackbacks are currently closed. Frome, Attends on an occasional basis.